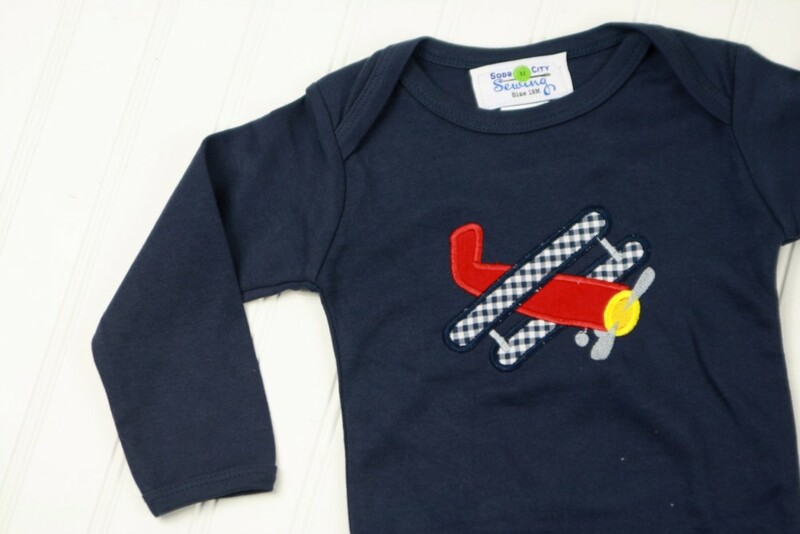 Boys navy cotton long sleeved shirt with an appliqued airplane. The green gingham pants are a perfect match. You can order the complete outfit, or just the top or pants. There's also the option to add a name under the plane. Price adjusts in bottom right corner based on your selections. Shipping Class A (see shipping options in cart at checkout). 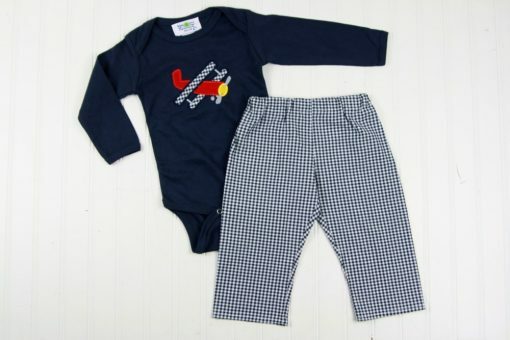 This toddler or baby boy pants set is perfect for special occasions or every day! 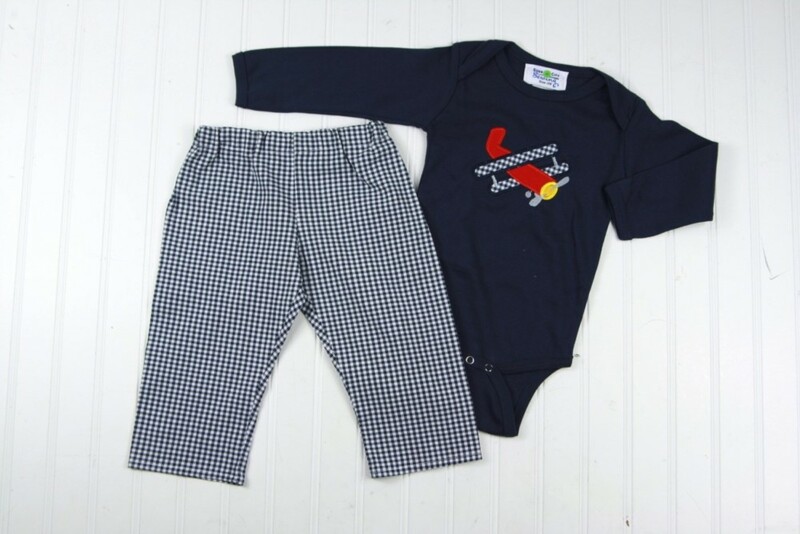 It’s so comfortable for babies or toddlers and so much fun to wear! The pants have elastic waist for a comfortable fit, and the preppy gingham check pants can go with other shirts already in the closet! They are washing-machine safe, so you’ll feel be able to wear the outfit over and over. 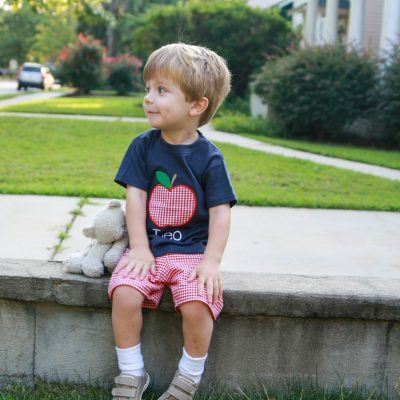 The long sleeved navy blue shirt comes appliqued with an airplane, and you can embroider a name underneath the tree for a personal touch! The tops are 100% cotton interlock knit. Bodysuits are available to size 18M. For bigger boys, T-shirts are available 2T and up. The green gingham pants are elastic waist for a flexible fit. You are welcome to get different sizes for the pants and tops, as well! OPTIONS: You can order the top, add a name, and/or add the pants. The font and thread color you select would be for the name or initials embroidered on the outfit under the tree. We suggest white or green thread to match. If you select No shirt or No Pants it will take that amount off of your total, the price adjusting in the bottom right corner. MIX AND MATCH: Consider adding another shirt to go with the pants for even more wear! 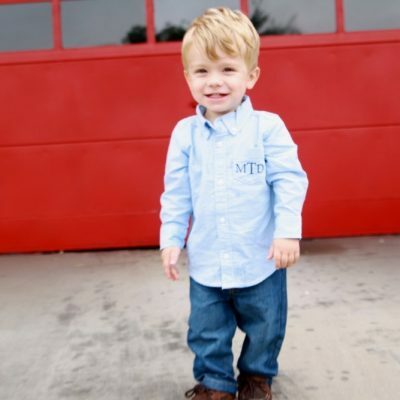 Our shirts and pants are great to mix and match! 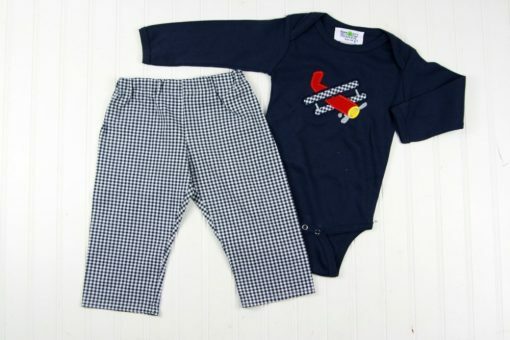 Thanks for visiting Soda City Sewing, where we’d love to make a custom baby boy pants set just for you!